Journalists are undoubtedly having hard time following official economic policy in Spain at the moment. The core of the problem they face is that we have a hydra headed government which speaks with many tongues. In some ways the lack of coordination can be put down to simple newness and inexperience, although it should be noted that all the principal actors were in action the last time the PP was in office, as part of the Aznar government. On the one hand there is Luis de Guindos, the former Lehman Brothers Spain CEO, who is now economy and competitiveness minister. Then, on the other, there is his dopellganger, Cristobal Montoro, long time professional politician with the country's Popular Party, who is the country's new finance minister. Then, of course, there is Prime Minister Mariano Rajoy who has decided he himself will assume overall responsibility for economic policy coordination and effectively be the country's economy "supremo", even though it is important to understand that he will normally communicate his decisions to us through the lips of his deputy prime minister, Maria Soraya Sáenz de Santamaría. The key point to grasp here is what Soraya says goes. Now having got that straight, and putting this important question to one side, we might like to consider other matters like economic policy, and how to handle that most serious crisis which Spain's economy finds itself in. Here Luis de Guindos has recently been most helpful, since he choose to use the pages of the Wall Street Journal to outline the general policy approach of the new government. As he tells us, "Fiscal consolidation is not a choice". In other words, Spain was going to stand by its commitment to try for a 4.4% fiscal deficit in 2011. (This reminds me of one of those old "billion dollar question" quiz shows, you know will you go for the big question, even though if you get it wrong you might loose everything - Spain is, he tells us, going for it). This public revelation was, to say the least, curious, since at more or less exactly the same time the "other" economy minister - Cristobal Montoro - was telling the Financial Times Deutscheland (that's why I mentioned several tongues) that the government was having a rethink, and maybe in the light of such a strong recession in Europe, a slightly smaller deficit reduction would be more appropriate (for those who will loose the subtelty of the argument in the German version here is a brief English account). Naturally - you already guessed - Soraya was quick to come out and make the position clear. Hours later, the Spanish government scrambled to nuance the comments, which appeared to deviate from what has been a strict policy of deficit-cutting. Deputy Prime Minister Soraya Saenz de Santamaria said the government was determined to meet the 4.4 percent goal and if "more reforms and greater rigor" were needed to achieve it, they would be enacted. Don't miss that bit, more reforms and greater rigour. Spain is evidently being entered for the "iron man" contest, although it wouldn't surprise me to soon see references to our dear Soraya as the new "Iron Lady". Not that this was the first time she had had to step in and separate her tow squabbling economy ministers, signs of tension between the two departments had already appeared during the first days of the government, with Cristobal Montoro claiming the 2011 deficit was 8%, a complete 8%, and nothing other than 8%, while Luis de Guindos was saying that the final number was likely to be several tenths of a percentage point above 8%. On this occassion it was not Soraya, but the interior minister Jorge Fernández Díaz, of all people, who came out and gave the official government version, 8.2%. Going back to the Luis de Guindos WSJ article, I would highlight a number of points. In the first place he makes a pretty strange claim. "We perfectly understand," he tells us, "the reasons our country has been brought to the outrageous situation of having the highest unemployment rate among developed economies." Now I don't know if I am alone in this, but I do find it a rather incredible, way of putting things. The phrase is even more incredible given that it repeats almost word for word a statement Prime Minister Mariano Rajoy declared earlier in the week. "My government," he told his audience, “knows perfectly well what it needs to do to improve Spain's reputation, stimulate growth and create jobs". At face value it seems an almost arrogant way of putting things, given that perfect knowledge is something we humans are not normally thought to have, and doubly so since even among "experts" there is still a huge debate going on about why Spain's economy didn't recover along with many other developed economies, but then it occurs to me that such a bold posture may be more to do with uncertainty and insecurity about what to do, and the aparrent disarray among the various economy representatives does seem to give this idea some credance..
"In Spain, we have inherited a very centralized wage bargaining system that establishes salary increases at the sector level. This system has proved to be one of the main reasons for the loss in competitiveness we have suffered during the last decade". I think Mr de Guindos is confusing two things here: why Spain lost competitiveness, and why Spain now has the highest unemployment rate in the developed world. It's The Housing Bubble, Stupid! Simply put I think Spain's centralised wage bargaining system can explain why Spain hasn't had an internal devaluation and wage and price reduction of the kind Latvia, or even, Ireland had. Spain's labour market and market structure is inflexible, and this is why the economy is having so much difficulty adjusting, and making the transition from a construction and consumer demand driven economy to an export driven one. 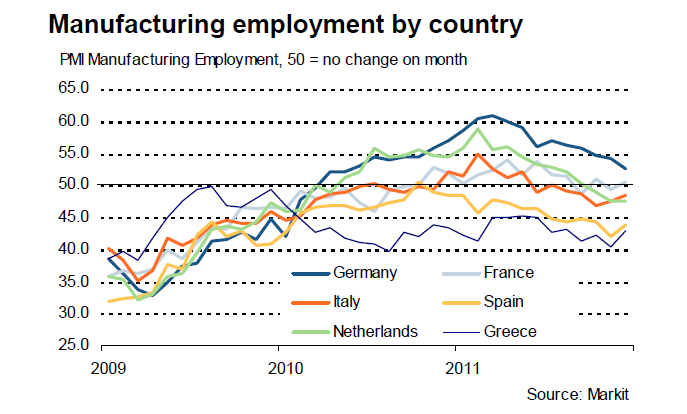 But this lack of labour market flexibility isn't NOT the main reason competitiveness was lost before the start of the crisis. The reason competitiveness was lost was the availability of excessively cheap borrowing made available by Europe's large and deep capital markets and cheap interest rates at the ECB. It was this massive and cheap liquidity which generated one of the largest property bubbles seen this century. The bubble created huge distortions (many of which have still to be unwound), and basically meant that it was too easy for everyone (workers and employers alike) to make money, so there was no pressure even on the employers themselves to address the fact they were paying increasing wages without getting increasing productivity. It was simply a "cool" time for everyone. Other countries lost competitiveness during those years, but not all of them had the same labour laws or bargaining systems. The problem here is that if you don't "perfectly understand" why the country had the crisis in the first place, then you may not be able to put the consequences straight. Spain's problems have a clear European dimension, a dimension which goes well beyond the simple difficulty of selling bonds which forms part of the Sovereign Debt Crisis. Strangely Mr de Guindos's article has little to say on this point, so here he and his government would do well to study a little more closely the playbook Mario Monti is working from. Now obviously Spain's labour laws and bargaining system needs reforming, and Spain's economy minister suggests that his government is working towards the kind of single contract being proposed by the authors of this article. Certainly they make a convincing case for the changes they propose, but my feeling is that a reform of this type won't be sufficient to dynamise growth in the way everyone is expecting, since the measure relies essentially on job churn to have an impact and this in an economy where employment is contracting, and likely to continue contracting over the next two years at least. Evidently there is currently a high volume job churn in Spain, but this process is only taking place among those workers the authors term "ousiders" - the ones with secure long term contracts (the "insiders") tend not to move (for obvious reasons, and naturally this is why the labour market is rigid and inflexible). Basically the present system favours older workers to the disadvantage of younger ones, who have to face very high levels of unemployment (not far short of 50% in some age groups) and those who leave their studies with often excellent qualifications find few opportunities for rapid promotion and all the evidence suggest are voting with their feet and steadily leave the country, following in the footsteps of an Italian experience which was already very clear even during the first deacade of the century. If you are going to rely on labour market reform to carry out your competitiveness devaluation, then something much more radical needs to be contemplated: like resetting the whole current system of contracts and staring over again. Naturally Spain's political leaders are reluctant to contemplate this, since the response from older workers already benefitting from seniority would be monumental. The electoral weight of voters over 50 in a rapidly ageing country like Spain is very important, and as far as politicians are concerned their neeeds are much more "strategic" than those of the far smaller generations of younger voters. It is not without significance that one of the fisrt measures the new government announced, despite the existence of what they call a most grave financial situation, was to raise pensions by 1%. Part of the problem with restarting a broken and structurally distorted economy like the Spanish one how to enable companies to restructure and downsize. In particular, if the country is to adopt a "new economic model" this process needs to be made much cheaper for the individual concern, and wages need to be tied to productivity, not seniority, with compensation funds for redundancy being held by central government, and not at the individual firm level. Spanish workers, like their Japanese counterparts, need to accustom themselves to the idea of adopting a second, less well paid, career in the 55 to 70 age group. We also need to get away from the idea that doing so-called "menial jobs" has some sort of social stigma attached. It sounds marvellous to talk about high-tech, high-value growth models, but the reality is that most of Spain's 55+ workers lack the necessary skills to participate in this, while there are lots of socially useful jobs (looking after old people, which is now almost entirely done by recent immigrants who continue arriving) that people could take on. Subsidising people at 58 to go for early retirement is no substitute for a sustainable employment policy. 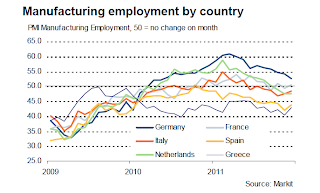 Naturally Spain is not alone in suffering from this growing brain and talent drain. There is a steady flow of young talent away from Europe's periphery, and it continues to cause controversy. Only this weekend Ireland's finance minister Michael Noonan got himself into some hot water by saying that an important factor influencing young people in leaving the country was a lifestyle decision. Naturally there is a lifestyle choice involved, in particular since many of the young people leaving don't want to spend the rest of their lives in societies driven by "depresssion economics", accepting the kind of lifestyle their older compatriots seem quite content to vote for. They don't want to first have to accept the main burden of the crisis (as the "oustiders" in all those inflexible labour markets), and then the cost of maintaining in perpetuity the various oversubscribed health and pension systems which Europe's ageing societied are going to produce. Michael Noonan is quite right, leaving is a choice, and in many cases it is an appropriate and intelligent one. What is not appropriate and intelligent is the response of national politicians either denying the phenomenon doesn't exist, or suggesting the consequences won't be important. Which brings us to the third strand of the new governments "gamechanging" policies, the reform of the financial system. "The new financial reform we will launch shortly will oblige banks to increase their provisions sufficiently to cover any writedowns that may emerge on their real-estate-related assets and loans. Taxpayers' money will not be used to finance the additional regulatory requirements arising from the reform. All the funds implied will have to come from the system's own internal resources". What this basically means is that while the ECB's 3 year LTROs will help banks with their liquidity problems, the banking system is going to be left to itself on the solvency related issues. Capital ratios have to go up, as will provisioning, and doing this without taxpayers mone lending will need to be cut back, there are no "ifs" or "buts". But if lending is cut back, how do you get growth or job creation? Why is it so obvious, you may ask, that doing Spain's financial restructuring with only a minimum of government money will lead to a reduction in lending. 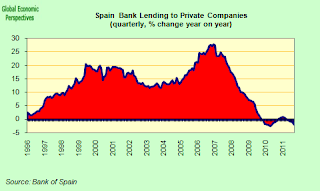 Well actually, this idea is not so surprising, Spain's financial system is struggling, and if you look at the charts below you will see that lending in Spain (to both households and corporates) is falling and has been doing so for some time. 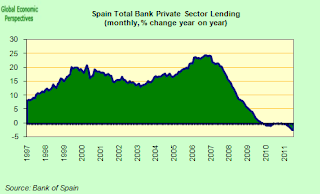 Loans and deposits at Spanish lenders fell at their fastest pace on record in November and defaults jumped as Prime Minister Mariano Rajoy prepared measures forcing banks to recognize more real-estate losses. 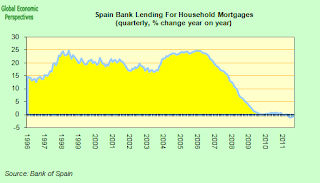 Lending fell by 2.94 percent from a year ago and deposits slid 2.99 percent, the biggest drop since the regulator’s records started half a century ago, the Bank of Spain said on its website today. 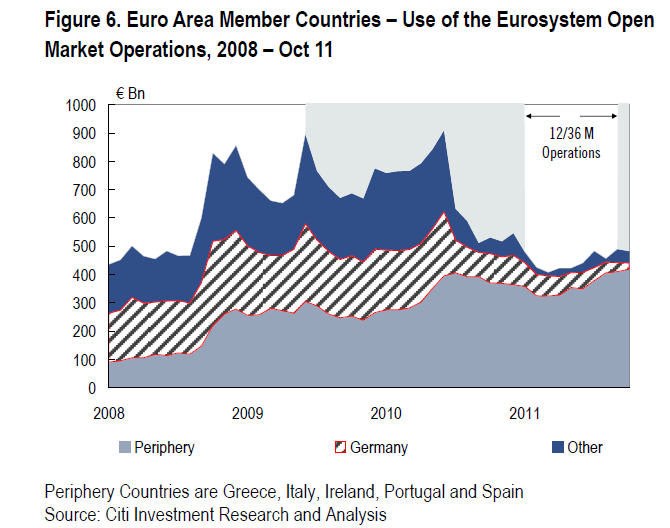 Basically the issue here is that most of the economies on the Euro Area periphery are currently over leveraged. That is to say the proportion of their TOTAL debt (public and private) to GDP is too high relative to their future capacity to pay, and this problem is really behind why we had the global financial crisis in the first place (in most developeed economies including in the US). If 4 years into the crisis people haven’t gotten thru to this simple point, then they can't have been reading the right kind of material.It is important to understand that from this point of view it doesn’t matter whether the debt is public or private. Now, and here comes the issue where there is debate, if you have too high a debt ratio (that is, if you are overleveraged) you can reduce it either by growing GDP (nominal GDP) or by reducing the debt. That is why Paul Krugman tries to ridicule those who say you can't reduce debt by contracting more debt. It isn't that simple. If you run a company, and you have a good product, then getting some working capital from the bank to let you produce, and even a subsidey from the government to get you started, then maybe by going to work you will be able to pay back more of what you owe. And as with the single company, so with the whole economy on aggregate. But, here comes the rub: the countries on the periphery can’t get the growth they need until after they have deleveraged, since getting more credit will only make them even more leveraged and since they have a competitiveness issue they can't expand their export sectors as fast as they need to to get traction. So they are stuck, and this - and not the credibility of some ratings agency or other - is what the whole Euro Area debt crisis is about. Once these economies have deleveraged, which means the banks will have less credit on their balance sheets, then, of course, the banks can leverage again and offer new credit. 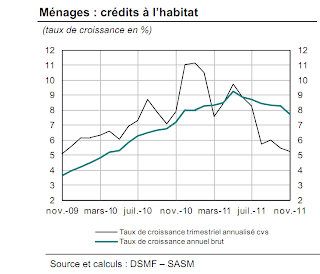 This kind of deleveraging is long painful and arduous, since it also produces deflation (economies contract along with credit) but with time (let's say a decade) competitiveness is restored. In the meantime it is not clear how many of the countries young people will have already thrown the towel in and left. The other alternative is to write off bad loans, but this means accepting losses, and with these government intervention in the financial sector. So banks and governments are reluctant to do this, since it balloons the deficit (see Ireland), and prefer the slow process. What I am saying is not that no new loans are possible, but that new loans can only be issued after old ones are paid or written off, and after the balance sheet has been reduced to deleverage a bit. 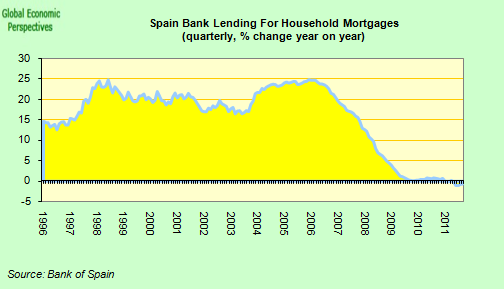 Which means the quantity of new loans is not sufficient to produce growth or (in Spain’s case) stop unemployment rising. This issue is deep structural (if complex) and there is no simple rule from a central bank which can produce new credit (although see my Masssendowngrade Effect post for more detailed explanation about bank "liability management", and how this interferes with the process of "creative destruction"). So Spain's government is basing its strategy on an attack on three fronts - the deficit, the labour market, and the financial system. They have made their analysis, and now they are going to work. On the fiscal deficit, their argument is not, of course, incorrect. 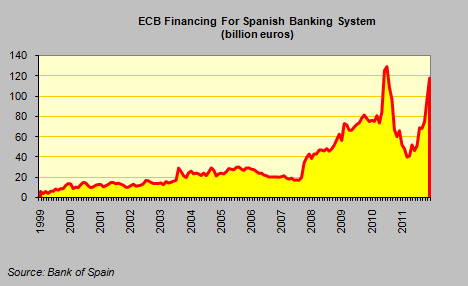 Fiscal consolidation at this point is not a choice but an obligation for Spain. However I can't help asking myself, given that Spain's debt to GDP at 70% is still significantly below the EU average, and given that the government isn't going to use public money to help clean bank balance sheets (at least it is going to try not to, it remains to be seen if it can avoid this outcome) whether it wouldn't have made sense to do what Cristobal Montoro was suggesting, and negotiate a bit more "wiggle room" with the EU on the 4.4% objective for this year, since really the cumulative effect of having a negative external environment, banks deleveraging and such drastic cutbacks will surely be - as I've been arguing - to send Spain into a serious economic depression (even the IMF now see Spain having a 1.7% contraction this year and a 0.3% one next, and the actual outcome could be significantly worse). Spain's economic problems are very grave. The country is facing a decade long depression, and if enough young qualified people leave during this period then the country could enter a negative dynamic from which it will never properly recover. At the outset (2007) I and others argued for a 20% internal devaluation to shift resources over to the export sector. This did not happen, and virtually no one is interested in the idea. The main priorities are still reducing the deficit, and restructuring the financial sector without injecting any significant quantity of public money. Both these policies are contractionary in their impact. In addition the proposed labour market reform is timid, and won't act quickly enough to stop the rot on the growth front. One of the key reasons given by Standard and Poor's recently for downgrading the Spanish Sovereign by two notches was preoccupations about the growth outlook in the context of the cut-backs and recapitalisation. Investor confidence and credit ratings will come back up when economic growth is put realistically back on the agenda for Spain. I have a feeling S&P's understand this reality a little more "perfectly" than Mr Guindos and his advisors do. In any event, at the end of the day we all live in an imperfect world where perfect knowledge is available only to gods not mortals. Well, that was the week that was, wasn't it? It started with a cheerful, upbeat market response to both the impact of the ECB's 3 year LTRO and the growing impression that Hungary was going to make some sort of "one-off" deal with the IMF, and ended near the depths of despair as S&P's announced the downgrade of 9 Euro Area countries, while the EU Commission worked hard to reinforce the impression that it was about to launch legal proceedings that could even lead to the temporary suspension of Hungary from the EU. It was a time of bitter sweet experiences, which started with Tamás Fellegi (that's him smiling in the photo below) heading off for his scheduled interview with Christine Lagarde. 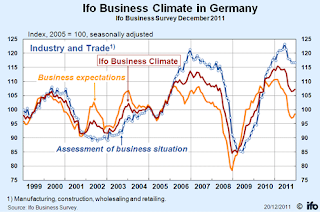 Then we learnt that the German economy had grown by a brisk 3% in 2011, only to have our hopes dashed by the clarification that most of the growth was in the first 9 months of the year, and in fact the country probably entered recession in the last quarter. Just as we were recovering from that initial shock, Irish stockbrokers Goodbody poured even more cold water on our breakfast cornflakes by telling us that Ireland would probably need a second bailout, since economic performance in 2012 was likely to be below expectations, while prevailing financial conditions would make an early return to the financial markets virtually impossible. Our spirits were fleetingly brightened by the news that Spain had managed a successful bond auction, but the cork was just as swiftly rammed back into the bubbly bottle as it had been pulled out when we discovered that Italy had not, and that LCH Clearnet had promptly reacted by raising the margins on the country's debt when posted as collateral. On the other hand Thursday did give us another brief soothing interlude, as Mario Draghi reminded us of all the beneficial consequences of the recent 3 year LTRO (Long Term Repo Operation), and cheered our spirits by informing us that he was not lowering interest rates again at this stage due to the growing signs of stabilisation his technical staff had been able to identify. “According to some recent survey indicators, there are tentative signs of stabilization of economic activity at low levels,” he told the assembled journalists, although he did go on to warn that the debt crisis continued to pose “substantial downside risks” to the economic outlook and the ECB stood “ready to act” if need be. Apart from the evidently weakening inflation, possibly the most important single indicator he will have had in mind in making the above statement would be the monthly PMI survey. The composite index (which combines manufacturing and services) shows economic activity contined to contract in December, but at a rather slower rate than in November, and in fact the rate of contraction in November was slower than the one recorded in October. So things are getting worse more slowly! Despite the evident differences between countries in their rate of deterioration, the stabilisation pattern is pretty generally reproduced across the Euro Area. 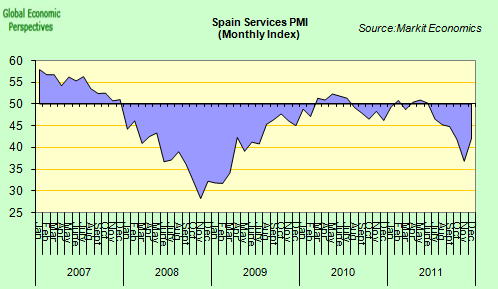 In Spain, for example, where services activity plummeted in November (at rates reminiscent of the last recession), the decline was significantly slower in December, although it was still, of course, a substantial decline. 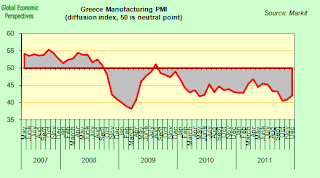 Even Greece's war-torn manufacturing sector showed signs of "contraction weariness" in December, although I fear that had the contraction continued at its earlier breathtaking pace we would soon have little left. 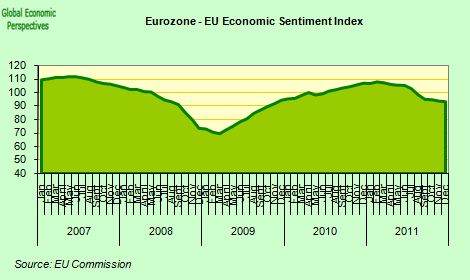 The EU sentiment index has also fallen much more slowly in the last two months, indicating that confidence is not deteriorating as rapidly as it was. 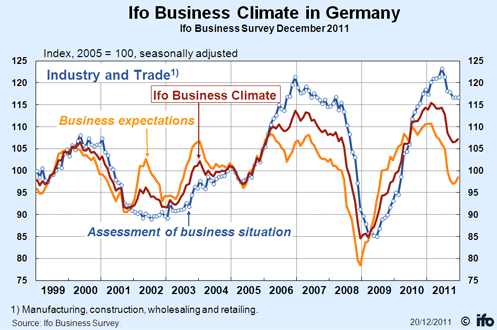 And the widely followed German IFO Business Climate index has perked up slightly in the last couple of months. "The uplift in the Eurozone PMI in December does little to dispel fears of the region sliding back into recession. Despite the upturn, the fourth quarter saw the steepest contraction since the spring of 2009, and forward-looking indicators suggest that a further decline is on the cards for the first quarter of 2012. In particular, orders for goods and services continued to collapse, suggesting that output and employment will be cut as we move into the new year". Of course, as everyone is by now only too well aware, the week finished on a crescendo as S&P's announced the widely anticipated downgrade of nine Euro Area countries. That being said, surely pride of place in this agitaed week must belong to Hungary, whose bleary eyed Prime Minister Viktor Orban can be seen in the photo below. It is early morning, and he probably hadn't slept that well after learning that the IMF would defer to the EU on all matters relating to whether his country was in compliance with its Treaty obligations before taking any decisions on future loans. As one country after another temporarily surrenders its right to an elected government to put itself in the hands of the technocrats (as Hungary did in 2009, before the election of the Orban government) I cannot help asking myself whether recent developments are mainly the result of the countries peculiar (and almost unique) history, or whether it is giving us an idea of the sort of thing we can expect to see if simple austerity as it is being practised all along Europe's periphery doesn't work out as planned. Certainly Mario Monti is alive to this possibility, as he said in an interview with Die Welt Online this week (German only I'm afraid), unless Europe's policy is flexibilized it will be a case of "after me the populists". All Alive And Well On ECB Cool Aid? 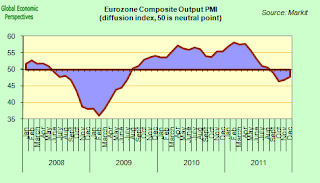 Perhaps the main point to take to heart from the events of the last week is the way the recent ECB liquidity measures have apparently been able stabilised the debt crisis, at least for the time being, even while it is not clear that they will have the same success stabilising the deterioration in the respective real economies. 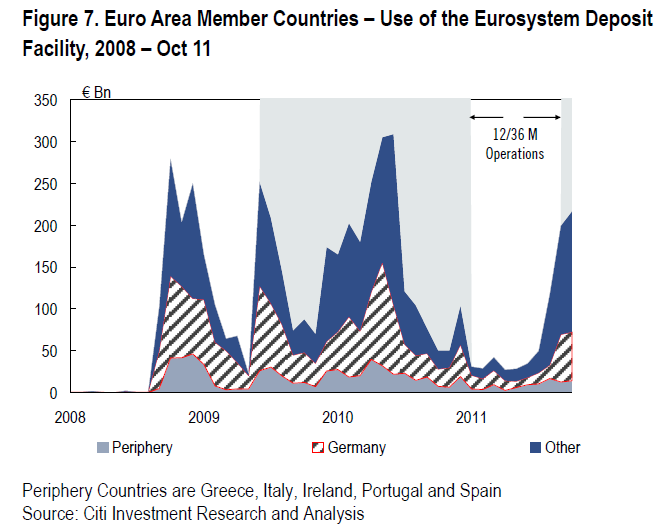 In a liquidity-providing operation which some have described as "unleashing a wall of money", in the week before Christnas more than 500 EU banks borrowed a total of €489 billion in three-year loans – equivalent to roughly 5 per cent of eurozone gross domestic product and the largest amount ever provided in a single ECB liquidity operation. 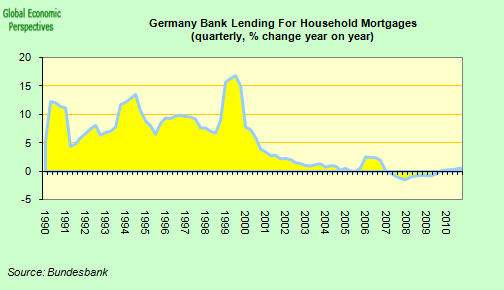 In fact only about €190 billion of this was new money, since the majority of the borrowing involved the consolidation of lending that had already been taking place on a shorter term basis. Despite the size of the demand, and some relatively succesful bond auctions, much attention is still focusing on the way Eurozone banks' overnight deposits with the European Central Bank have been rising in the wake of the move. In fact these themselves hit yet another all-time high last Thursday according to the ECB, with the quantity deposited hitting €489.906 billion, up from €470.632 billion the day before. This phenomenon has lead some analysts to suggest the operation may be a failure. Such a judgement would be a premature and erroneous in my humble opinion. It's The Real Economy, Stupid! In order to assess the extent to which the recent ECB measures have succeeded we need to think about what the objectives really were. In the first place the bank clearly hoped the commercial banks would use some of the money borrowed to buy new issue government bonds in the primary market, and earn themselves a bit of "carry" (the difference between what it costs them to borrow from the central bank and what the bonds purchased pay) in the process. The much needed additional income will help them improve their bottom lines and allow them to accumulate some additional capital to help with their capital ratios. This has lead some observers, like Nomura's Kevin Gaynor, to argue that the ECB is now doing overt (as opposed to covert) QE. In some senses this is surely the case, since the bank was already doing what some called QE by stealth way all the way back in 2009 (as Claus Vistesen argued here, and I argued here). 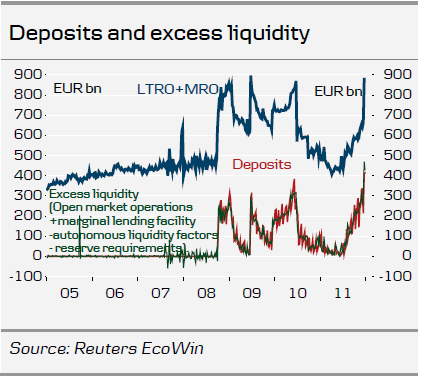 But before digging into all this a bit further, let's go back to the issue of those growing overnight ECB deposits. 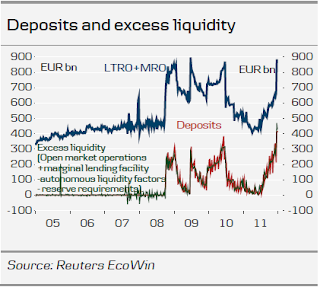 For some observers the very size of these deposits constitutes evidence that the ECB 3 year LTRO isn't working as anticipated. This argument, as Danske Bank's Senior Economist Frank Hansen argues, is misleading, since the volume of ECB deposits only give us a measure of aggregate excess liquidity across the Eurosystem, and doesn't tell us anything about the distribution of that liquidity between countries or between banks. "Does this mean that the operation has failed to stimulate government bond purchases? No, not really. If a bank uses money from the LTRO to buy government bonds (or any other paper) in the secondary market, the amount will still show up as a deposit at the ECB (now on behalf of the seller’s bank). If a bank buys government bonds in the primary market, the amount will also show up as bank deposits at the ECB if the government spends the receipts or places them at a private bank. Thus, the increase in deposits does not imply that the 36 months LTRO has failed to stimulate government bond purchases (or other trading for that matter)". So basically, if we think for a moment about maturing, and not new, additional issue, government bonds, then commercial banks along the periphery buying the replacement issue can allow their peers in the core to recover their investment, and park the money. The only way the money from these sort of bond transactions doesn't show up as excess liquidity is if the national government concerned places the takings on deposit at the central bank, or if an investor takes the money they have recovered from a redemption out of the Eurosystem. The same goes for private bank debt, which often just moves from being a liability one bank has with another commercial bank in the Eurosystem to being a liability with the ECB. Naturally the bank that recovers its money may well then park the proceeds on deposit and hence it will show up as excess liquidity at the ECB. So, while short term liquidity needs may be being catered for (at least up to 3 years), there may be a deeper phenomenon at work via the LTRO, whereby the core leaves the periphery. In fact that seems to be happening. 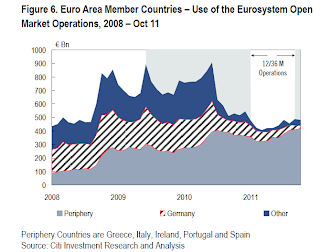 The charts below (which were prepared by Citi Research) show the situation up to the end of October (latest data), and make clear that it is commercial banks on the periphery who are, in the main, making increased use of the ECB's open market operations, while it is banks in core Europe who are using the deposit facility. There is no reason to suppose that data post October will reveal any fundamental shift in tendency. Spanish banks, for example, increased their ECB borrowing from roughly €70 billion in September to €118 billion in December (nearly a €50 billion - or 75% - increase), while use of the deposit facility only went up from €9 billion to 15 billion, so the Spanish banking system clearly needs this liquidity. Another area where the transfer of liquidity doesn't show up as a change in aggregate excess liquidity is when banks offload their wholesale liabilities to other EuroArea banks and refund via the ECB. Here again, if they do it smartly, they can even earn a bit of "quasi carry" in the process, by buying back their debt at well below face value from those who are anxious to exit the periphery, and then refinancing at the ECB without writing down the underlying asset. This could be termed a liability "write down", and again the procedure earns the bank a nice bit of income which can subsequently be used to help the recapitalisation process. Take the Portuguese Bank BPI (the country's fourth largest), which is making public tender offers to buy back its debt. If all concerned tender their bonds to BPI, BPI will pay something short of €1.5bn cash to investors. Mortgages which were previously sitting in one of their SPVs will return to their balance sheet, and ECB money will now be on the other side financing them allowing significant profits (and capital) to be reported. In this particular tender the smallest discount is 35% and the largest is 65%. Investors may initially baulk at the offer, since they will nurse a heavy loss (equal, naturally, to BPI´s profit) but ultimately they will probably be only too happy to be able to walk away from Portugal, and with some cash in their pocket to boot. Iberian banks were already aware of the benefits of this kind of restructuring during the 2009-2010 liquidity wave, and went about quietly repurchasing their bonds (bank capital, securitizations, senior bonds) on a selective and private basis at a discount. Much of their reported profits in those years in fact came from either the ECB carry trade or this kind of transaction. 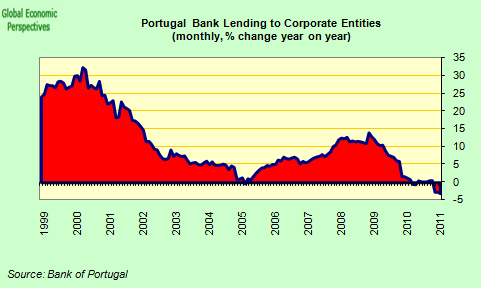 So when we read that another Portuguese bank - Banco Espirito Santo - has just had €1 billion of debt guaranteed by the Portuguese state (a soverign which can't itself go to the markets) it isn't hard to imagine that the process going on in the background is something similar to that seen in the BPI case, and that the debt is being guaranteed so it can go over to the ECB to be posted as collateral. And Italian banks would seem to be doing something similar, since they issued around €40 billion in government backed bonds specifically to take to the ECB. The bonds are held by the banks themselves and stay on their books to maturity, their only purpose being to provide collateral for use at the ECB. 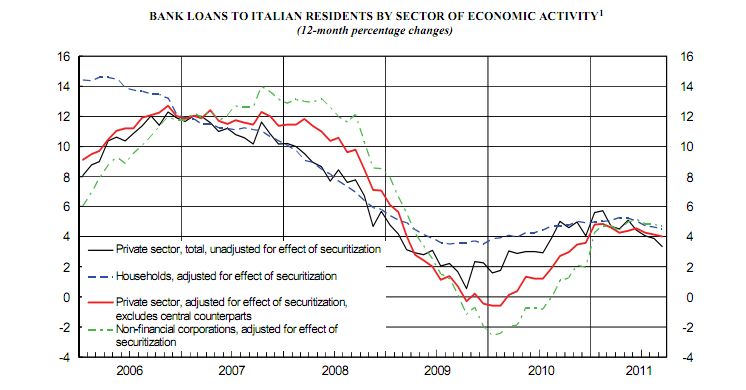 In fact Italian banks took something like €116 billion from the LTRO, or almost 25% of the total. Perhaps this is why Unicredit CEO Federico Ghizzoni and other European top bankers met ECB officials in Frankfurt back in November, to discuss new rules for collateral. In Spain securitised mortgages sitting on the balance sheets of the bank-owned Fondos de Titulizacion de Activos could also be recycled in this way (here's a complete list, although note that these Funds are regulated by Spain's CNMV and not the Bank of Spain, which is why their presence is relatively unknown and people are able to accurately say that the central bank has been very strict on SIVs, since they weren't their responsibility). The euro is losing the relationship with riskier assets that underpinned the currency in 2011 as the deepening sovereign debt crisis reduces the creditworthiness of even the biggest economies in the region. The 17-nation currency has fallen 8.7 percent against the dollar since October, while the Standard & Poor’s 500 Index has gained 3.4 percent, and the correlation between the two dropped to 58 percent from a record 91 percent in November, according to data compiled by Bloomberg. The euro had moved almost in lockstep with investments linked to growth, including stocks and the Australian dollar, since January 2011. This decoupling is taking place as European Central Bank President Mario Draghi cuts interest rates and promises banks unlimited cash for three years to rein in soaring borrowing costs for governments... Strategists also anticipate more losses as the US economy improves while the euro zone shrinks, driving international investors away from the region’s assets. So if the first two objectives were to help the struggling sovereigns, and enable the commercial banks to refinance their debt, then to some extent these objectives have been met. 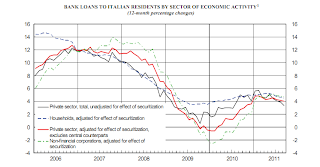 But what about the third objective, moving credit on the periphery to get the real economy moving again? Well, here the ECB's measures are likely to have far less effect, and indeed what effect they do have may be in some way a mixed blessing, since the banks seem far more worried about demonstrating they have an adequate level of core capital than they are about participating in solutions to real economy problems. To understand why this simply increasing aggregate liquidity doesn't necessarily help individual countries, it is important to realise that credit conditions in the Euro Area member countries are not uniform (a much more detailed exposition of this point can be found in this earlier post). 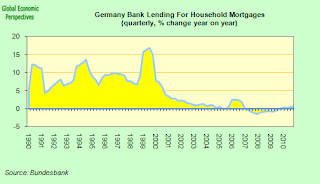 In countries like Germany, Finland and the Netherlands, credit is more or less freely available, even if demand for it is limited - German corporates are awash with cash, and it has been a long, long time since German households were digging their way into debt. In France and Italy, banks are drawing in their horns, but credit is a long way from being frozen. 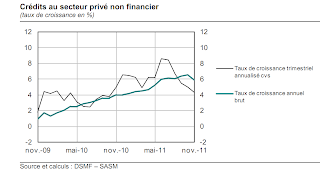 Although in France, the rate of new loan generation in the private sector has been sliding since mid summer, especially if you look at the thin black line in the chart below (Bank of France), which shows the rate of change on a three monthly rather than an annual basis. A similar position can be seen in the case of home mortgages. 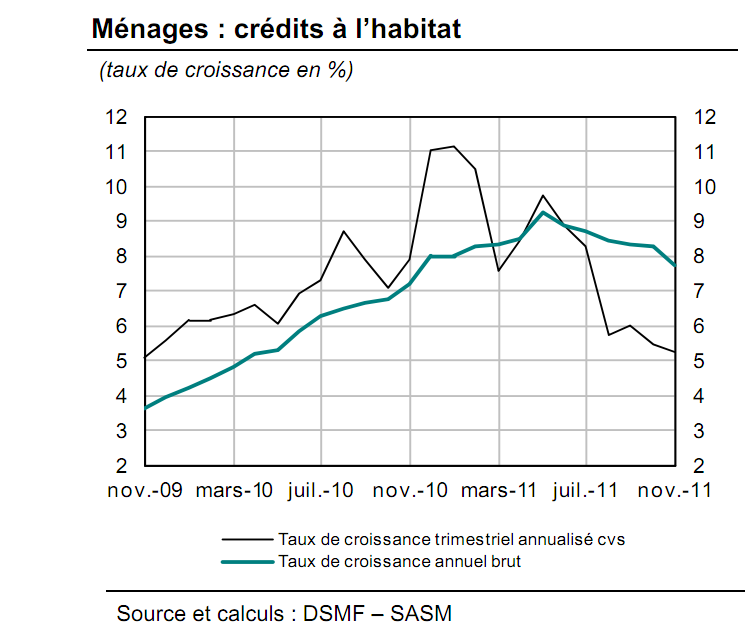 Now in the French case, given that the private sector is not heavily overindebted, unemployment is not excessively high, and a demand for credit from solvent clients exists, it is quite possible that the ECB measures can help stabilise the situation, and put a brake on the implosion. On the periphery, however, where populations are heavily endebted either directly, or via their sovereigns, where the economy isn't functioning properly, and unemployment is high and rising, the problem isn't only the unavailability of credit, but also the shortage of solvent clients who actually want to leverage themselves. For increased liquidity to mean that credit becomes expansionary for the real economy again, it is the banks themselves who need to deleverage (and not simply write down their liability side), by disposing of the large volume of continually restructured but basically non-performing credit they have on their books. Behind the credit crunch in these countries lies a problem of massive economic structural distortion, produce by the lending and borrowing boom during the "good" years. What is needed is what Joseph Schumpeter referred to as a process of "creative destruction", whereby some enterprises die so that others can be born, and naturally some loans are written off, despite the fact this has unpleasant effects on bank profitability and capital ratios. To really get credit moving again in some of these periphery economies, a large chunk of loans need to be written down, and support needs to be offered by the sovereign to enable this to occur. Unfortunately the ECB's liquidity provision could have precisely a perverse effect in this context, as it may well enable those who should die to stay alive. Commercial banks, at the discretion of their central bank, may now package straighforward bilateral commercial loans to present as collateral at the ECB. This measure, which in theory was intended to enable the banks to extend "good credit" may now enable them to restructure and keep on their balance sheet loans that should really be classified as "impaired" and somehow resolved. In the case of Spain, for example, in addition to the properties they have acquired, banks still have oustanding loans of over €300 billion to developers on their books according to Bank of Spain data. The majority of these loans are not classified as either non-performing or sub-standard, and are hence considered to be "good" (I will refrain from saying "excellent"). In principle there is no reason why a significant number of these "good" loans cannot be packaged in some way or other to serve as collateral to be posted at the ECB. Naturally this takes some of the pressure off Economy Minister Luis de Guindos to establish a bad bank, since for the time being the ECB can, in part, serve this purpose for him. And if the banks write down their liability side a bit, then this may also help him with the €50 billion or so he estimates will be needed for bank recapitalisation. No wonder he feels the amount of public money needed will be minimal! The only real downside on this is that foreign investors may well be dumping Spain, while the country (which still runs a current account deficit) continues to have an external financing requirement. None of this is either uniquivocally good, or unequivocally bad, it depends. What the liquidity move will do is buy the banks time to sweat out some capital onto their balance sheets, and make them better able to withstand more of those dreaded "stress tests" (assuming, that is, that the European Banking Authority allows some "wiggle room" to enable them to keep maintaining their risky sovereign debt holdings). What it won't do is help put the real economy straight, or allow the banks to get back to what some would consider is their basic task which is guaranteeing a normal supply of credit to the economy. Today's rating actions are primarily driven by our assessment that the policy initiatives that have been taken by European policymakers in recent weeks may be insufficient to fully address ongoing systemic stresses in the eurozone. In our view, these stresses include: (1) tightening credit conditions, (2) an increase in risk premiums for a widening group of eurozone issuers, (3) a simultaneous attempt to delever by governments and households, (4) weakening economic growth prospects, and (5) an open and prolonged dispute among European policymakers over the proper approach to address challenges. If we look at the list of 5 issues they identify, the recent 3 year LTRO may do something to help ease the first two of their concerns, especially in core countries as far as credit conditions go, and at the short end in terms of peripheral sovereign debt spreads, but it will do virtually nothing to resolve the other key issues, and it will not alter the course of the crisis in the longer term. In other words it is not a game changer, even though it will buy time. But time is - if we look over to Hungary - something we will eventually run out of. Handing over the adminsitration of one country after another to a group of approved technocrats may well work for a while, but it won't work forever. One day or another, if the measures taken don't work, Mario Monti will be replaced by the populists, and a new chapter in European history will open. At the present time the policy emphasis on fiscal rectitude and structural reforms, to the neglect of the deep competitiveness and imbalance problems which exist within the Euro Area, is leading us all to no good place. A quick glance over in the direction of Hungary might suggest to us what that place could look like. Well, that really was the week that was, wasn't it. It's over, let it go, there's another one coming just around the corner, and my initial impression is that it is unlikely to be a quieter or more relaxing one. On one level, Friday’s news was not really surprising. The French rating downgrade was a shock foretold. As was the breakdown in talks between private investors and the Greek government about a voluntary participation in a debt writedown. A proposition that was unrealistic to start with has been rejected. We should not feign surprise.And yet both events are important because they show us the mechanism behind this year’s likely unfolding of events. The eurozone has fallen into a spiral of downgrades, falling economic output, rising debt and further downgrades. A recession has just started. Greece is now likely to default on most of its debts and may even have to leave the eurozone. When that happens, the spotlight will fall immediately on Portugal, and the next contagious round of downgrades will begin. Wolfgang Munchau, Financial Times, Sunday 15 January 2012. Tension surrounding the application of a series of so-called "unorthodox policies" by Hungary's Fidesz government has certainly been rising in recent days. While Washington has been reasonably quiet as govenment emissary Tamas Fellegi meets with top IMF officials, Brussels has seen a veritable avalance of official statements and policy initiatives. Despite constant rumours that an agreement with the IMF is near, I find it pretty implausible that any deal can be reached without some kind of EU assent. At the present time this assent is unlikely to be forthcoming, and indeed the "ante" has been pushed up and up. The latest example here is the fact that Brussels has given the Hungarian administration till next Tuesday to do something about altering the country's new constitution or face the prospect of legal action, and possible suspension from the EU under article 7 of the EU Treaty. Budapest on the other hand has been full of conciliating words, but the key point is we have yet to see anything meaningful in terms of action. Brussels now has issues pending with Budapest on a number of fronts. In the first place Hungary has been tried and found wanting in relation to its compliance with the conditions of the EU excess deficit procedure to which it has been submitted for some time now. This issue is important in its own right, since it was with the balooning of the fiscal deficit in 2006 that all the recent political problems really began. The current deadlock with Budapest on the deficit front has added importance in the present context since the EU is in the process of formulating a new treaty whereby states using the Euro will be compelled to bring their debt and deficits into line with EU regulations or face sanctions. 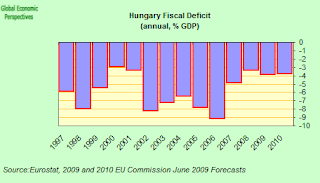 "Hungary has not made sufficient progress towards a timely and sustainable correction of its excessive deficit." The EU executive proposes to "move to the next stage of the Excessive Deficit Procedure (EDP) and recommends that the Council of Ministers decides that no effective action has been taken to bring the deficit below 3% of GDP in a sustainable manner." "Subject to this Council decision (under Article 126(8) of the EU Treaty), the Commission will then propose to the Council new recommendations addressed to Hungary (under Article 126(7) of the Treaty) with a view to bringing to an end its excessive government deficit,"
Prime Minister Orban is very proud of the fact that the deficit came in at under 3% of GDP in 2011 for the first time since the country joined the EU in 2004. In fact the country had a budget surplus, estimated to be between 2% and 3% of GDP, but this surplus is entirely due to juggling with revenues that come from appropriating the private pension funds. As the EU Commission put it in their autumn forecast. "Following a deficit of 4.2% of GDP in 2010, the general government balance is expected to turn to surplus thanks to one-off revenues linked to the elimination of the obligatory private pension scheme. The official estimate for this year's surplus has been revised up from 2% of GDP (contained in the April 2011 Convergence Programme update (CP)) to 3.9% of GDP in the autumn notification. The larger surplus is mainly due to: (i) higher one-off revenue stemming from the elimination of the obligatory private pension scheme (now amounting to 9¾% of GDP, i.e. ½% of GDP higher than previously assumed); (ii) an intention not to assume the debt of the public transport companies (1.4% of GDP) and not to buy out selected PPP projects (0.7% of GDP), contrary to earlier plans; and (iii) additional measures of 0.4% of GDP adopted in September 2011". The EU Commission calculate that the underlying deficit in 2011 (that is the deficit stripping out the one-off cash injections) was around 6% of GDP, and while the budget promise for 2012 is under 3% of GDP there are lots of factors (like lower GDP growth, higher interest costs, and higher expenditure from automatic stabilsers) that could easily mean the real number continues to be over 3%. So, enough is enough with "unorthodox fiscal policies" is what the country is now being told. So the question now posed is that someone here is going to have to back down, and to do so significantly. The question really is "is Orban ready and willing to do so". Friends and acquaintances of mine in Hungary had been warning me for some time that this kind of confrontation would (almost inevitably) come. Orban had gone one bridge too far, and it would be hard for him to turn back. Over the last few days a close acquaintance, who has been becoming increasingly concerned about the situation, has sent me a number of e-mails on the topic. Below I reproduce a selection of extracts, just to give a feel for how some (perceptive and sensitive) people inside the country see the situation. As far as finding a way out is concerned, I am very, very sceptical. Given the super-majority in parliament and the trenchwarfare between left and right, except for a full blown revolution or the landing of US paratroopers (both, eveidently, extremely unlikely), the only way to topple Orban is to have a revolt within Parliamentary group of FIDESZ. This is also very unlikely, as Orban is a very charismatic and ruthless leader with an uncanny ability to get through to people and to preserve his leadership. Moreover, all FIDESZ MPs are personally selected by Orban, and only God knows what kind of "documents" are existing in Orban's hand with which he could blackmail them. There ought to be a good deal given the widespread corruption in the Hungarian political system. It seems that nobody either could or would be ready to challange him. Even, I could safely say - reading the right wing press and speaking with supporters of Orban - that a decade of gradual shift towards a radical and anti-capitalist and anti EU ("Empire") position has created a mindset which may even accept a break with EU in order to save "freedom", "independence" and "national goals" and reduce "foreign capitalist exploitation". Thus, I don"t really see the internal force, which could stand up to the government. Those lonely voices, who criticised Orban on grounds of economics, have been successfully isolated and there was never any attempt to build up a formal institutionalised form for expressing different policy options within the broad right wing camp. We could even find that any measures on behalf of EU against Hungary only reinforce Orban's stand-alone policy and rally behind him the ultra-nationalist camp, which could be easily as large as 30% of the population. Given that he controls state administration and the armed forces, and taking into account the complete reaoganisation of these branches of the state together with the wholesale nomination new staff, he may have enough resources to sustain a populist autocratic order for a long period of time, like in Belorussia. Here comes to play also the aging population and the flight of young professionals into other EU states: older people typically are not those one who are revolting, and those who would revolt may increasingly decide to try and escape in time before the new "iron-curtain" falls down. Actually, to be precise: maybe a break with the EU is not an option at this point, but once the EU suspends Hungary, that option maybe more easy to sell. We are faced with a charismatic leader who may actually have an agenda, and not be only "surfing" on the current reality trying to get the best for himself. Launching WWII was huge misinterpreation of their own capacity on the part of Germany, especially when coupled with Barbarossa, and was not supported by much of the population and may be even the army and the conservativies had their misgivings, but still, Hitler prevailed, and.... I dont want to say that Orban is comparable with that truly evil person, but we are facing with a similar charismatic leader with a strong will and with deeply internalised goals. ..
And maybe there is not a masterplan a la Mein Kampf or Hossbach notes. But the changes, the events, the steps he is taking, sometimes irrationally, sometimes rationally, are taking him towards this final irrational step. He may stop at the last moment, but it may happen that fear of loosing power pushes him over the brink and he may choose the completly irrational step. I cannot say how the future will happen. But I can say that his speeches, acts, messages belong to a distinct political family of radical right wing views and these inevitably lead to a break with the current EU. And his personality traits also suggest a certain kind of personality, one who is able to carry out this radical step, if the circumstences arise, and he feels forced to do so. Lets just hope that this scenario will not be the real one. .. I think we need to be clear at this point, nothing here is inevitable, but the usual kind of "bandaid" kick-the-can-a-little-bit-further-down-the-road solution is not going to be easily available. I think it is going to be very hard for Orban to back down significantly, and especially so in the case of having the constitution rewritten significantly. In many ways this is why I used the cryptic headline and final paragraph in my last Hungary post. What I was getting at there is the thought that this is now Orban’s great opportunity to go down in the history books, possibly even as the man who opened up a chain of events which finally destroyed the Euro. This is his challenge, and his possibility to live eternally ( I doubt there is any other one). He is currently just three steps from heaven, so it is comparatively easy for him to get to his intended destination. But its also easy for him to get things wrong (from his point of view). I mean, he could do the "right thing", be a gentleman and back off to make a deal with the EU under which he had to retire from politics. I can just see José Barroso now, alighting from the plane and waving the critical piece of paper to the delighted press photographers. That way, of course, five years from now no one would even remember Orban's name. So the question of whether a deal is still possible is the billion dollar issue in all this. We have a chicken and rooster situation: who will blink first. Hungary may blink since the country's leaders may not wish to find themselves outside the EU and forced into default. 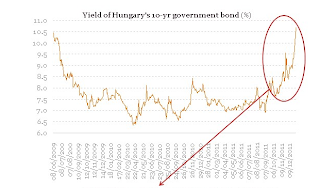 Or alternately, some of Orban’s advisers may already accept this scenario as an inevitability, and welcome default as the only way of getting to grips with the forex debt problem. They may even already be thinking in terms of a post Euro scenario, and assuming that the Euro cannot hold together. On the other hand the IMF (under EU pressure) are unlikely to accept the forex default and debt restructuring that Hungary probably needs to achieve sustainability in the longer term while they are still in the EU. The constitution law is probably going to be the real sticking point, since if the government needed this to avoid letting the people who had their pension savings appropriated take recourse to the law, then unwinding it would probably mean the public finance issue would quickly get bigger, and quite possibly right out of control. On the other hand while the EU may dig in for a time, they may ultimately fear contagion more than they do an unruly Hungarian government. Europe's leaders have basically been motivated by fear of something or other throughout the whole Euro debt crisis, they have never really been out there in front of the curve. No pain today please seems to have been the rule. So with the second Greek bailout visibly wobbling, and much of the rest of Eastern Europe vulnerable to retrenchment by West European banks, fearing the inevitable contagion they may well finally go for a "peace in our time" deal. Naturally, in this post I have dwelt on the political dynamics (and dangers) of the current situation (and indeed the post contains not one single chart), but we should never forget there is a real economic backdrop to what is happening in Hungary, one in which IMF programmes in Eastern and Southern Europe are not working out as planned, possibly due to a faulty diagnosis of the problem (see my earlier post for explanation). In addition, it is hard to say at this point whether what is happening in Hungary is unique (due to its 20th century history) or whether it is a harbinger of what is to come along the EU periphery as populations steadily get disillusioned with policy packages which simply don't work. To answer this question we will need to see into the future, but to see into the future we will have to get there first. In the above post I argued that the IMF was very unlikely to open negotiations with Hungary before the Hungarian administration responded satisfactorily to the EU requests for compliance. Last night the IMF issued a press statement where Christine Lagarde made plain that this is indeed the stance they are taking. Thus Orban's "divide and rule" strategy isn't going to work. On the other hand, reading between the lines in his latest speech, I don't think Orban is getting ready to eat humble pie, rather he is getting ready to play "now you see me, now you don't" with Europe's leaders. "Our general approach is that we are open and flexible, we are ready to negotiate all the points, but what we need is not political opinion but arguments. And when the arguments on behalf of the European Union are convincing, then it's better to accept and follow that line. There is no reason not to do that. We are absolutely open and flexible and waiting for the argument. But yesterday's comments from the EU did not contain any argument, just opinion, saying that they don't like it, it's against the general legislation of the EU. But we would like to get more specific points on the points (where) they would like to see modifications or corrections. And we are ready to consider it." 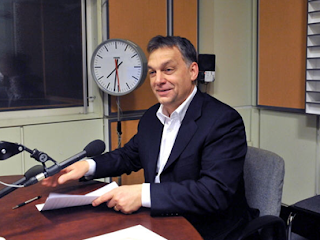 "Orbán’s unusual high-wire act might work, but he must avoid Hungary’s debt downgrade to “junk”. This is easier said than done, because the debt is currently under review and the other shoe can drop at any moment. A sovereign debt downgrade, with a run on the forint or on the banks will probably finish his government". Of course, that's just it, Hungary's debt has now been downgraded to junk, and Orban's government is now facing a "life or sudden death" situation. Hungary's unofficial ambassador to the IMF,Tamás Fellegi, is reportedly facing a "terrible atmosphere" after his arrival in Washington on an exploratory mission whose objective is to open up communication about a new financial lifeline for the country. Frankly, given the recent record of relations between the two institions involved it isn't hard to understand why. Leaving aside the long list of recent grievances, it was Hungary who decided to walk away from the IMF in the first place, suggesting it could manage quite well on its own, thank you very much, so the Washington based lender is now hardly likely to welcome the country back as some sort of long lost prodigal son. To make matters worse, the country has now opened up a second front by generating a serious dispute with the EU Commission, and other European institutions like the ECB, so it is only to be expected that the Fund will not reach any sort of agreement with the Hungarian government, until after the path has been cleared at the Brussel's level. Indeed such is the degree of dishumour of Europe's leaders with the present government, that it is still not clear whether the price for any form of aid might not be Orban's own head, and the installation of a more technocratic caretaker government. There are, after all, recent precedents for such a development in Greece and Hungary, and indeed the former Hungarian prime minister Ferenc Gyurcsány was effectively forced out by Brussels in March 2009. Not unnaturally Viktor Orban has been visibly trying to back away from the rapidly deteriorating confrontation, and only last Friday said his administration believes striking a deal with the European Union and the International Monetary Fund on a financial safety net for the indebted country is "an urgent task". Just to rub it in, he went on to declare his total support for the idea of central-bank independence. Government spokesman Andras Giro-Szasz went even further, saying the country was ready to "adjust any law that's against European Union regulations." Meanwhile both the EU and the IMF are digging their heals in, and taking a hard line. European Commission President Jose Manuel Barroso has written to the Hungarian prime minister, calling on him to withdraw recent offending legislation since they likely failed to comply with community law and could well prove to be incompatible with the EU Treaty itself. According to a report which appeared on the website Origo.hu, Barroso asked Orban to withdraw the legislation on the central bank as well as a 'stability law' proposed earlier this month which would tie the pace of debt reduction to the rate of economic growth. "I would forcefully advise you to withdraw two pieces of cardinal law now in front of parliament," he is reported as writing in late December. Taking a leaf out of Angela Merkel and Nicolas Sarzozy's book perhaps, Orban seems to have ignored Barroso's plea, since the bill went into law on 30 December. Only 6 days and a downgrade or two later, the mood is rather different, and Tamas Fellegi told reporters before boarding the plane to Washington that Hungary is open to talks about the central-bank law, indeed there is nothing the country isn't open to talking about if need be to secure a loan. 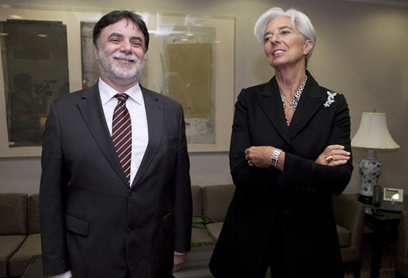 Nonetheless both the IMF and the EU will surely continue to play hardball, after all they now have the upper hand. Hence a report which appeared on another Hungarian website (Figyelo) this weekend, which cites a "precautionary" programme that was being prepared for Hungary. The document the website reproduced also suggested the IMF board (which will meet on 18 January to discuss Hungary) was of the opinion that the country could receive a Stand-By Agreement - which carries more conditions than a precautionary agreement. The report describes Hungary’s political climate as "complicated", and suggests the chance of Hungary losing its EU Cohesion Fund support because of an excessive deficit procedure that has dragged on for eight years a "real danger". Should this eventuality materialise Hungary would loose funding equivalent to 2% of GDP. Yet whatever the political obstacles, it is very likely that some sort of deal will be patched together. The consequences on both sides of the fence are too large to play with for too long (although remember accidents in history do happen, indeed following one school of thought they are the very motive force of history). Last weeks downgrade from Fitch (to BB+ aka "junk") will have concentrated everyone's minds, since it was one further warning of what would quickly happen if agreement were not reached - the currency would fall through the floor, the debt would become rapidly unsustainable and the country would default, and even continuing membership of the EU would be put in doubt. As in then Greek case, it is doubtful at this point that anyone is ready to walk through this particular door, even if they repeatedly keep getting shown it. 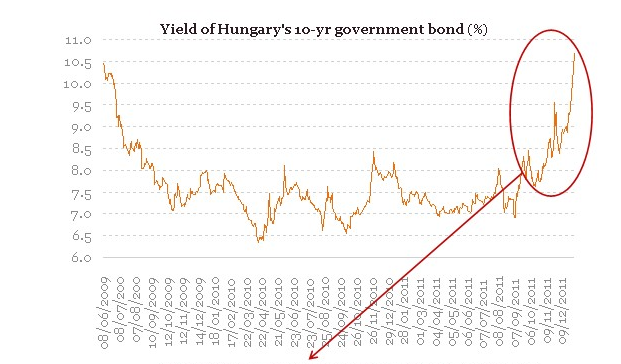 Naturally the financial markets have responded badly to all the brinksmanship and uncertainty, with the forint repeatedly hitting record lows against the euro (the latest was of 324 to the Euro on Thursday), while the yield on 10 yr government bonds has spiked sharply (see chart above from Portfolio Hungary). Following the Fitch decision Hungary’s 5-yr CDS spread leaped by 38 basis points to 754 bps, dragging Poland's (up 16 bps to 307 bps) and those of the Czech Republic (up 15 bps to 194 bps). 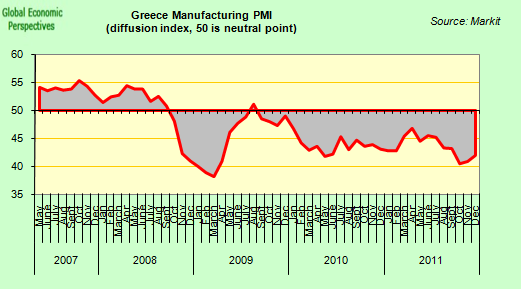 Naturally, as in the Greek case, it is the risk of regional contagion which is the biggest headache facing policymakers. "And if we move over to Hungary, then we find that as of last Friday CDS stood at around 285, well below the highs of over 400 seen as recently as last November in the wake of the Irish crisis. 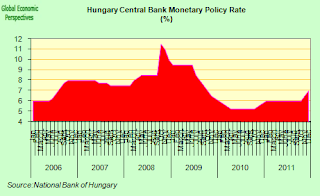 Arguably the Hungarian case is the most glaring example (of risk underpricing), since it is the East European country with the highest debt to GDP levels (around 80%, of GDP, of which 45% is forex denominated) it has very high gross foreign debt (around 135% of GDP), and it is a country where institutional quality is a constant cause for concern. In many ways Hungary is the Italy of the East. Apart from the presence of a strong trade surplus there is not that much to commend in Hungary's recent economic performance, yet its CDS has fallen into line with a regional pattern, and there is little in the way of what is happening in Spain and Italy to be seen in the spread, let alone what is going on in Slovenia and Slovakia". Obviously market sentiment has changed, and the question now is whether markets are overreacting. In the short term they may be, since although the danger of falling into a default spiral is real, there is the also a genuine possibility (but not certainty) of a deal being reached. But in the longer run they are not, since what Hungary is not suffering from is a short term liquidity crisis (or even a balance of payments one, the current account is in surplus), but a long run solvency and social sustainability one. 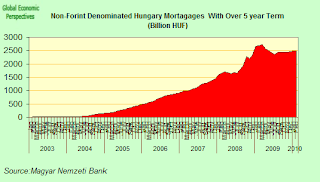 But to get to see what the end of this story may be, we need to go back to the beginning, and the origins of the present Hungarian crisis in the market correction of 2006. Those who could see that the global imbalances which were developing would eventually unwind couldn't fail to see the warning signs that year, as Iceland, Turkey and Hungary all wobbled under the force of those early seizmic tremors. That was when I got interested in Hungary, and took the decision to set up a dedicated blog for the country. Hungary seemed interesting for a number of reasons. It was a harbinger for many of the things which were to come, the rapid expansion of a fiscal deficit following the ending of a credit driven consumer boom (think Spain or the UK today), the ageing and declining population phenomenon in Eastern Europe, and it became the test pad for the application of "confidence building" measures, austerity programmes and structural reform to the economy of a country which had serverely lost competitiveness. Nearly six years later, and with the Hungarian economy on the brink of a possible default, perhaps it is now a good time to take stock of whether this approach has worked. Some came who did not bother whether they would have a place in the country's government, because they understood that this bloody country is about something else. They can understood that it could be worth being a politician here at the beginning of the 21st Century because we can create a different world......Instead, we lied morning, noon and night. I do not want to carry on with this. While this answer may well satisfy journalists and political sociologists, it cannot be entirely satisfactory for economists, who realise there are underlying processes (beyond flawed and corrupt individuals) behind these phenomena and want to get tot he heart of them. Could it be, for example, that the 2006 deficit was the culmination rather than the start of something. Certainly there had already been large deficits from 2002 onwards. I've looked at a number of examples now of where fiscal "extravagance" suddenly breaks out in a country - Portugal in the late 1990s, Spain more recently - and a common pattern I note is that government deficts often surge at the end of a consumption boom as politicians try to keep economic growth humming and living standards rising, even while revenue falls. To some extent this does seem to have been Hungary's case. As can be seen in the chart below, the country did have a very large consumption driven boom between 1999 and 2002. After 2002 the thing evidently eased off, meaning government revenue slowed, and hence the start of the deficit problems. Why the consumption boom ended is not clear, but it does form part of a pattern. Although conventional economic theory doesn't seem able to account for the phenomenon, many countries seem do seem to pass through some sort of transition wherby they move from been consumer driven to export driven economies. 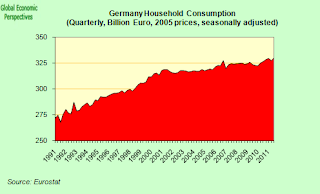 Germany is a good case in point, since as we can see Germany had a substantial consumer boom in the 1990s before converting itself into the export champion we have now grown to know and love. The big difference between the German and Hungarian economies though, is in the extent to which they lost competitiveness during the boom years, and in the extent to which the government tried to use deficit spending to sweep the problem under the carpet. The chart below shows a comparison of movement in unit labour costs between the two countries over the relevant period. 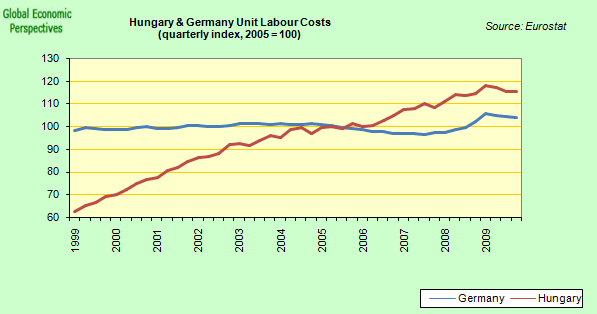 Now it is important to realise that unit labour costs are not about "catch up" improvements in living standards, they simply tell you how productive your workers are for each hour worked (or the cost in labout terms of each euro of GDP), and as we can see, while Germany held costs almost constant, Hungary let them rip. Which simply means that once you can no longer rely on consumer borrowing or spending for headline growth in GDP, you can't fall back on exports, because your economy isn't competitive enough, which is the issue all along the EU periphery, although Europe's leaders are mainly in denial on the issue, simply following the fiscal paper chase without digging any deeper to try to get at what might be at the root of the problem. 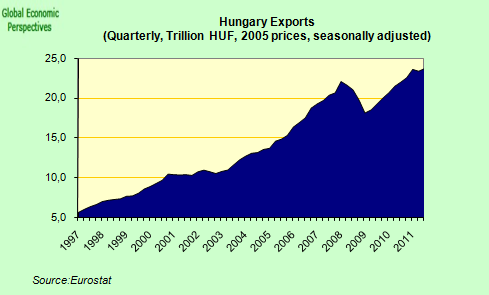 Now the interesting point is that Hungarian exports have in fact risen substantially over the years. 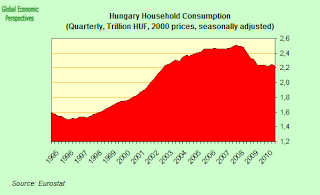 But impressive as all this looks, it has not been enough to get the kind of GDP growth that Hungary evidently needs (among other things to pay its debts and its contingent liabilities to its elderly population). In fact, despite the massive increase in exports since the end of the global financial crisis, Hungarian GDP has only recovered slowly. Hungary’s economy fell by 7% in 2009, grew 1% in 2010, and is heading back into recesssion at the end of 2011. Even leaving out the crisis year of 2009 Hungary has only managed average growth of under 1% since the austerity measures began in 2006. Something, somewhere evidently isn't working as it should. In addition to the ongoing programme of structural reforms what Hungary needs is a short sharp shock in the form of forint depreciation, to recover a large chunk of competitiveness and boost investment into the export sector. In this sense "competitiveness" means having an export sector which is large enough (as in Germany) to drive GDP growth forward. At present value added in Hungarian manufacturing is only just over 20% of GDP as compared with over 40% in the German case (the gross export values are misleading, since Hungarian industry is highly intergrated with German industry, and a lot of the activity is processing components which are imported and then re-exported). But this kind of forint depreciation (which to some extent we are seeing now under the impact of the crisis) is impossible to achieve without debt restructuring (or outright default) since so much Hungarian debt is denominated in other currencies (largely Swiss Franc - roughly 85% of Hungarian domestic mortgages are denonominated in CHF). Gross external debt is around 140% of GDP and rising as the forint falls, while government debt stood at 83% of GDP at the end of September, and around 45% of this is forex denominated. No Devaluation High Interest Rate Trap? So far from wishing for the forint to fall, the central bank is busily raising interest rates to try to sustain its value. Base rates have now been increased twice since October, and now stand at 7%, even though the country is heading towards recession and most central banks are near the zero bound. Naturally, raising interest rates only helps choke off declining domestic demand even further. Incidentally, the sharp drop in Hungarian retail sales that can be seen in July 2009 is the product of a 5% rise in VAT, a rise from which Hungarian sales have never really recovered. So much for the received folk wisdom that consumption tax hikes are "comparatively harmless", since the real situation is "it depends". Naturally, this export dependence is not simply anecdotal. 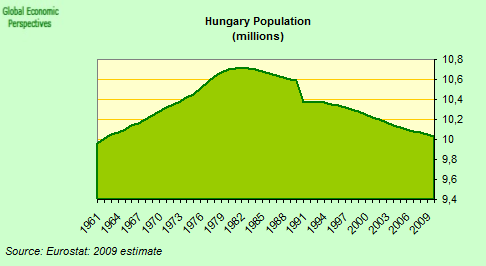 Hungary, like many of its Central and Eastern European peers, has a massive demographic problem. Population is already falling, and any sudden default would only precipitate the added issue of a sharp surge in the numbers of qualified young people packing their bags and leaving. And the potential labour force is both ageing and shrinking. So the problem isn't going to go away, and is only set to get worse with time. The Harbinger Of Things To Come On The Periphery? 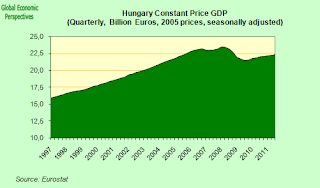 Thus Hungary is in a similar situation to many countries on Europe's periphery (in or out of the Euro), without real devaluation the economy will never get enough growth traction, and restructuring of the debt at some stage or another is more or less inevitable. But there is another factor which gives what is happening now in Hungary special significance, and that is the problem of "reform weariness". Basically, if the solutions which are being promoted by the IMF and the EU Commission are based on a faulty or incomplete analysis of the situation, then the measures being promoted eventually won't work as they should, and this will lead to disappointment. The political dynamics of what then happens is what should be concerning those who are able to think about such things. Could Hungary be the first example of a country that has lost hope and gone down the road of believing in demagogic politicians? Will there be more Hungaries? Could this be what the future in countries like Greece, Latvia, Portugal and Italy will look like. And if it is, how the hell do you hold the EU, let alone the Euro together? This is the burden of responsibility that now falls on the shoulders of those with responsibility for taking the decisions. 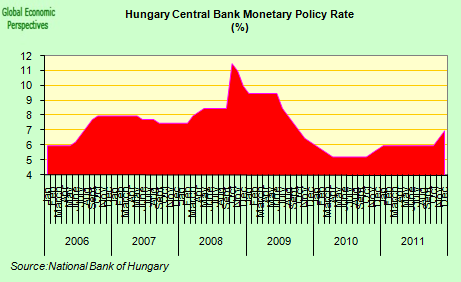 It was, after all, in Hungary that the new orthodoxy of relying on “non-Keynesian” effects related to expectations and credibility was formally announced and put to work. Naturally this approach was subsequently transferred from emerging market countries (like Hungary) to more developed economies along Europe's southern fringe. 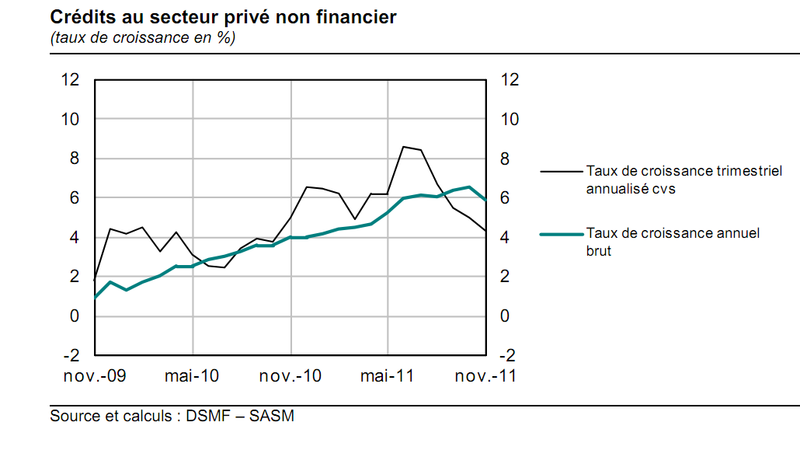 Private consumption, unfortunately, has notably failed to rise. Perhaps there will be more than a little historic irony involved in Hungary being the country where the whole experiment eventually went badly wrong, although I doubt the Hungarians themselves will se it that way. Back at school I remember learning about the example set by the British army sargeant at Vimy Ridge who lead his troops out of the trenches and into the withering fire of the German machine guns with the phrase "Come on You Bastards, Do You Want To Live For Ever!" This was the classic example, it seems, of charismatic leadership. Only years later did I twig the double entendre of the expression (which could also have been, "Come on You Bastards, Don't You Want To Live For Ever!" So this weekend, as he tosses the coin to decide whether to accept the EU conditions or not, Viktor (she loves me, she loves me not, she loves me....) Orban may do well to pass an idle moment perusing over the immortal lines left for our greater edification by the late, great and one and only Eddie Cochrane.